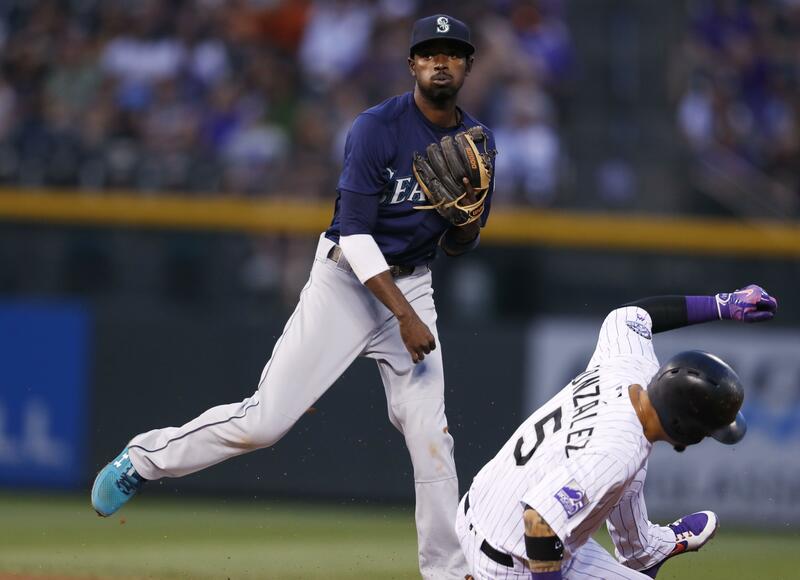 UPDATED: Thu., July 26, 2018, 4:32 p.m.
SEATTLE – Dee Gordon’s ability to do the spectacular at second base is one of several reasons why the Mariners are looking at using Robinson Cano at first base when he comes off his 80-game suspension on Aug. 14. Since Cano is ineligible for the postseason, keeping Gordon at second base – a position where he won a Gold Glove with Marlins – is a logical choice. But Gordon’s range and athleticism are glaring in comparison to Cano. But sometimes the capability of making the impossible play can lead to mistakes on plays that probably shouldn’t be attempted. For the second consecutive game, Gordon made a costly throwing error on a difficult play that ultimately cost the Mariners a run. In the seventh inning of Wednesday’s eventual 3-2 win, Gordon tried to fire a ball to first base on Brandon Belt’s hard ground ball that bounced off the glove of Ryon Healy. The throw to pitcher Mike Leake, who was covering first on the play, was uncatchable, sailing into Seattle’s dugout. Belt, who was injured on the play, was rewarded with second base, which isn’t ideal for the leadoff batter of an inning. That extra 90 feet meant that a groundout to second off the bat of Buster Posey didn’t have a chance for a double play, but instead allowed pinch runner Chase D’Arnaud to move to third. D’Arnaud scored easily from third on a blooper to left field off the bat of Brandon Crawford. In Tuesday night’s 4-3 loss, Gordon’s running/charging flip on a Pablo Sandoval’s soft roller to the right side of the infield wasn’t snared by Healy and allowed Steve Duggar to score the winning run from second base. Gordon has made five errors in 49 games since returning to second base this season. So what does manager Scott Servais think of the two throws on difficult plays? Is Gordon trying to do too much? Should he just put the ball in his pocket? Healy is hoping he’s heating up with the July temperatures. He smashed his 21st homer of the season and added another single in Wednesday’s win. Over his past six games, he’s 8 for 19 with a double, three homers and eight RBIs. Healy has changed up some of his preparation work in the last few weeks. Published: July 26, 2018, 3:51 p.m. Updated: July 26, 2018, 4:32 p.m.